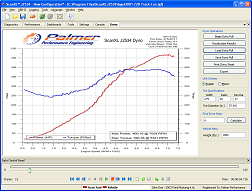 ScanXL ELM - Palmer Performance Engineering, Inc.
ScanXL™ is our professional line of diagnostic scan tools. Built on top of our advanced scan tool technology, ScanXL™ delivers the full range of generic diagnostics for any OBD-II compliant vehicle sold worldwide, along with providing manufacturer-enhanced diagnostics for many vehicle types. It gives you access not only to the powertrain systems, but also ABS, airbag, and other proprietary systems that would otherwise require expensive dealer tools to work with. It allows viewing, charting, logging and playback of diagnostic data in real time via the vehicle's OBD-II diagnostic data port. 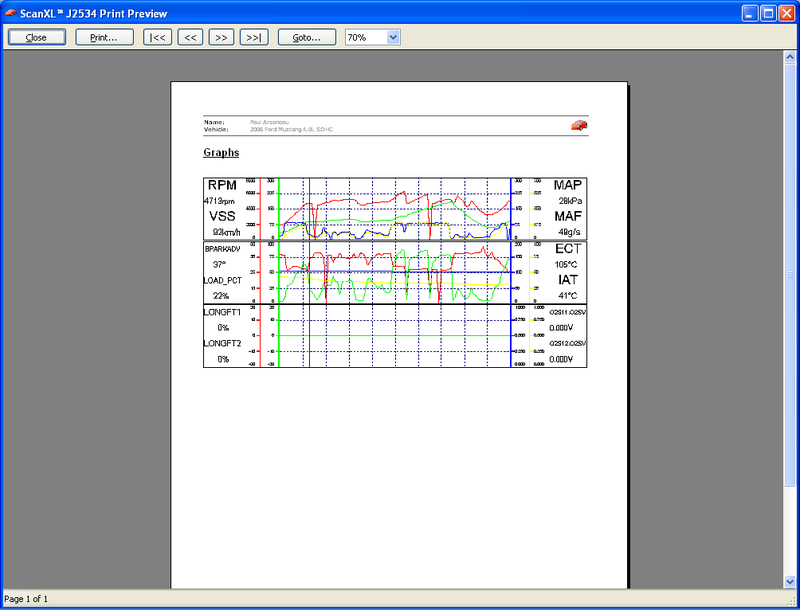 It also allows viewing of vehicle Diagnostic Trouble Codes (DTC's), Freeze Frame data, and other vehicle information. 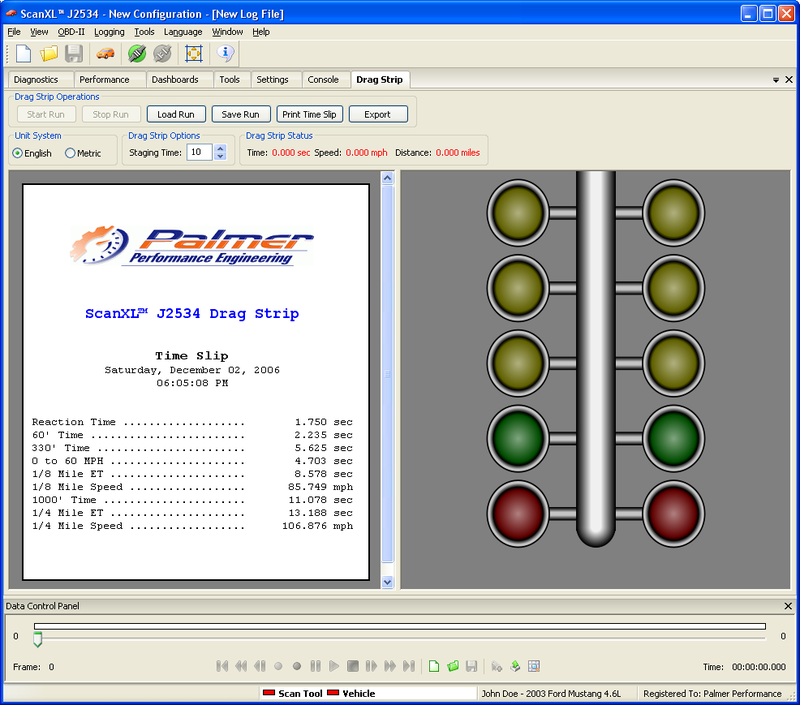 Supported OBD-II protocols: SAE-J1850 (PWM and VPW), ISO-9141, ISO-14230 (KWP2000), and ISO-15765 (CAN). Visit our user forum for discussion and information about ScanXL™, product features, and new releases. If you are the owner of an independent service or repair facility then you know that good tools can mean the difference between being able to find and fix the problem, or having to send the customer elsewhere. With generic only OBD-II scan tools you often cannot service some vehicle systems like ABS, airbag, or other proprietary systems. 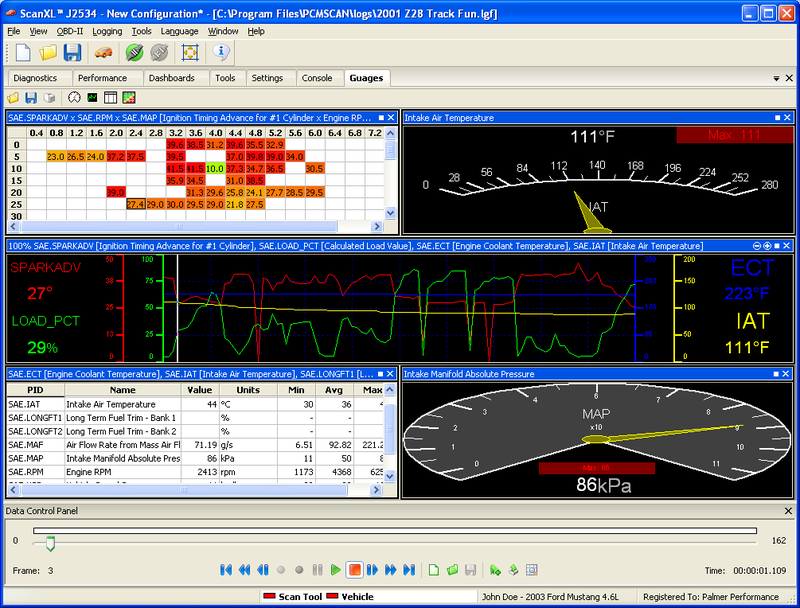 Using our ScanXL™ diagnostic scan tool, you now have access to enhanced diagnostic capabilities for not only the powertrain systems, but also ABS, airbag, and other proprietary systems that would otherwise require expensive dealer tools to work with*. Chrysler, Dodge, Plymouth, Jeep, Eagle Coming Soon! Toyota, Lexus, Scion Coming Soon! *Requires purchase of an enhanced diagnostics add-on package. Using the ScanXL™ Vehicle Manager you can keep track of multiple vehicles and owners simultaneously. 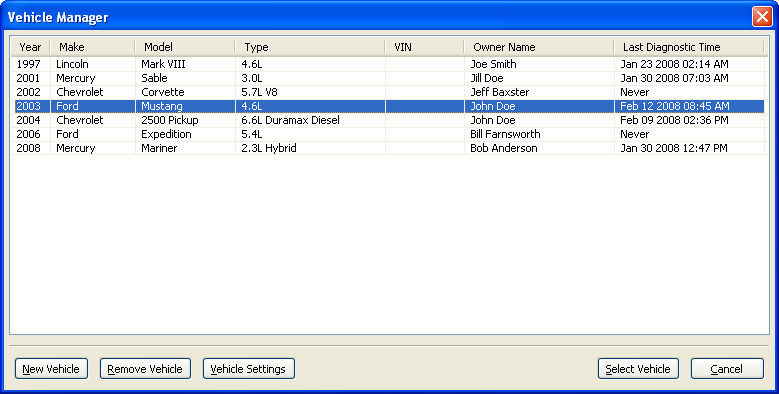 All vehicle specific information is stored in the Vehicle Manager. 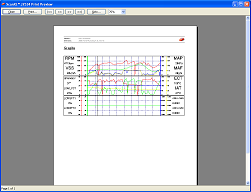 Automatically keeps track of VIN (if available) and date and time of last diagnostic session. When adding new vehicles, supports easy vehicle lookup through the built-in vehicle database. With our patent-pending DashXL™ technology you get high quality dashboards on any screen size. Highly configurable realistic looking gauges. Gauges can be moved, resized, and laid out to resemble your own dashboard. 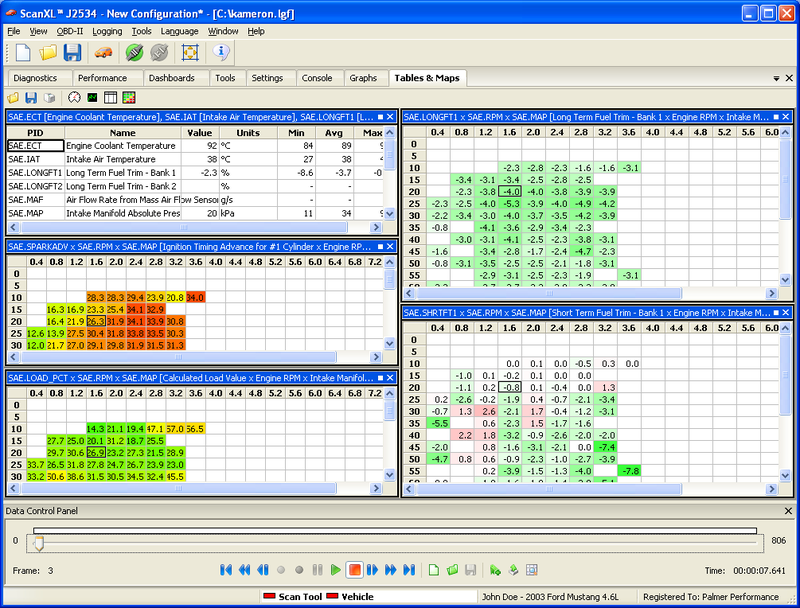 Virtual dashboard layouts can be loaded and saved from pre-existing templates or your own custom creations. 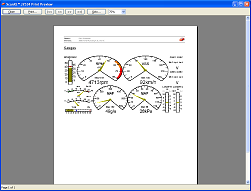 Gauges can be configured to report the minimum, maximum, and average values of the parameter being monitored. Highly configurable graphs allow simultaneous graphing of up to 8 parameters per graph. 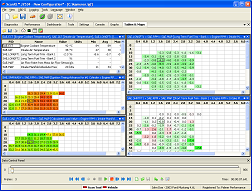 Tables can be placed on virtual dashboards and customized to report any parameters you want. Maps can be placed on virtual dashboards and customized to display a full 3D view of any desired parameters. 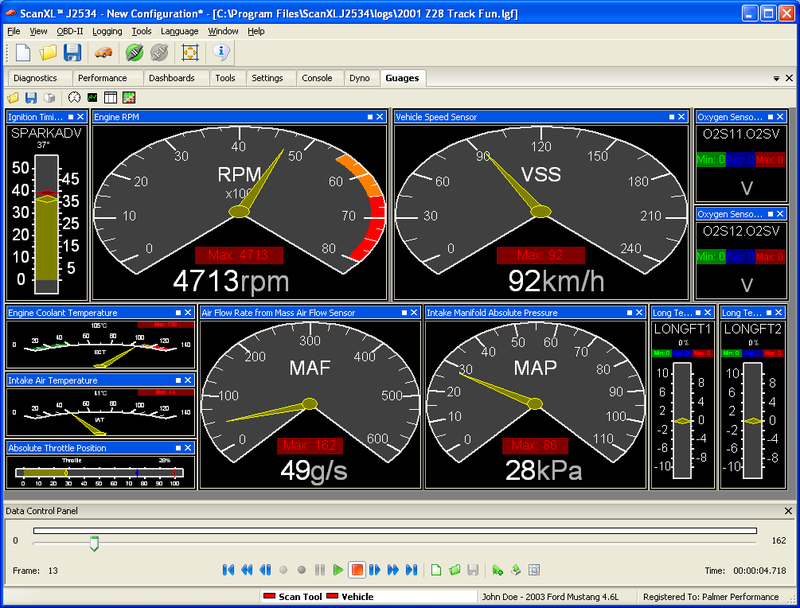 You can set up an unlimited number of gauges, graphs, tables, and maps on your virtual dashboard. The drag strip displays a countdown and timing light and measures your launch and reaction time. At the end of your run, you get a timeslip with the stats from the run. Measures reaction time, 60' time, 330' time, 0-60 MPH, 1/8 mile ET, 1/8 mile speed, 1000' time, 1/4 mile ET, 1/4 mile speed. 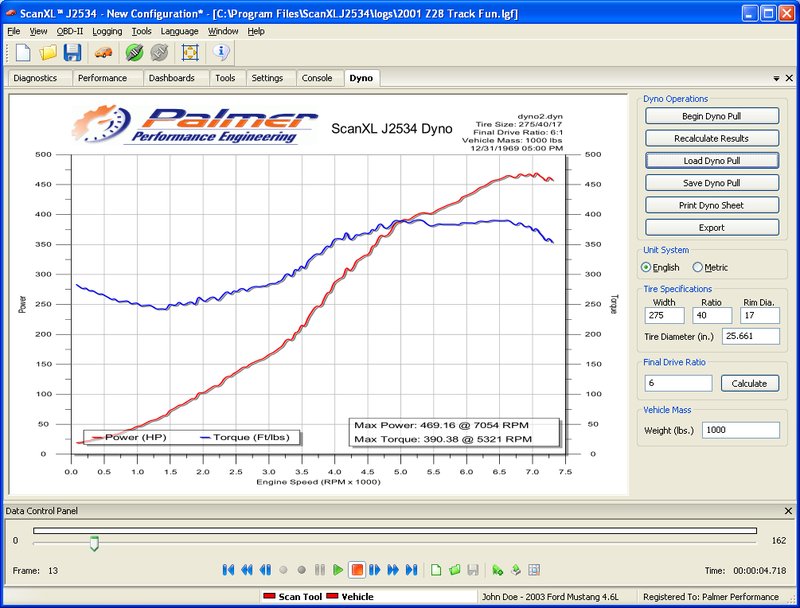 If you use aftermarket performance parts, the new digital dyno feature will let you test horsepower and torque to measure their impact on your vehicle's performance-- just try out the dyno and see if those parts were worth the money! Supports both English and Metric units of measurement. 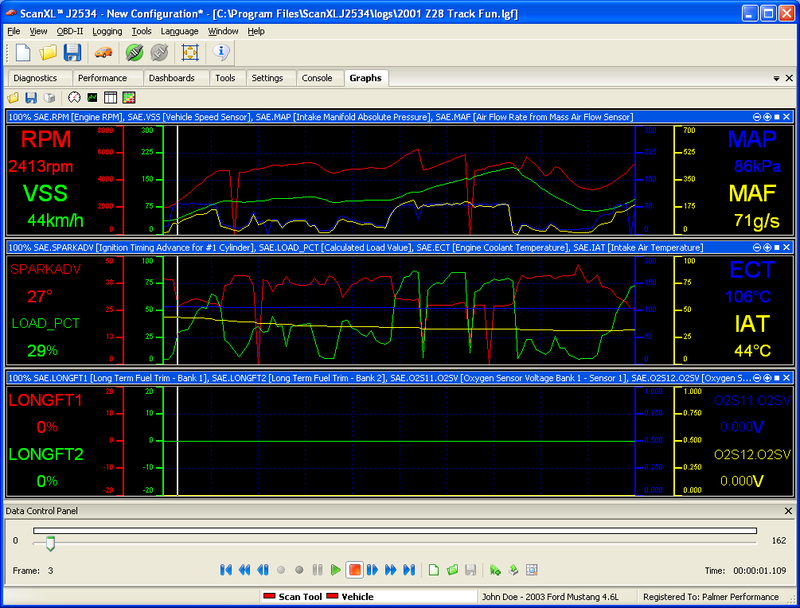 Currently supports over 220 generic OBD-II parameters, including O2 sensors. Also supports all aux. 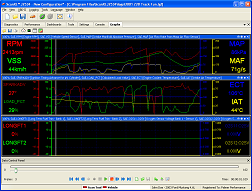 input parameters available from the Innovate Motorsports LM-1 Wide Band O2 meter. Also supports the AEM UEGO wide band O2 meter as an aux. input. Also supports the TechEdge wide band O2 meter as an aux. input. Also supports the PLX Devices iMFD Sensor Module as an aux. input. Also supports the Zeitronix ZT-2 wide band air/fuel meter as an aux. input. Playback speed can be adjusted to play faster or slower than real time. There are no restrictions on how much data you can log, it is only limited by how fast your OBD-II interface cable can send the data and by how much memory you have in your computer. Customizable log file data export to .CSV file for easy viewing in other programs like Excel. PIDs can be assigned priorities to speed up the data capture rate. Full support for data log file bookmarks - if you notice the engine misfiring or some other problem, using the log file bookmarks you can just reach over and press F6 to add a bookmark into the logged data that is being recorded. Then you can come back at any time and see exactly where the bookmark is and view the surrounding frames of data to analyze the problem. Read stored and pending Diagnostic Trouble Codes. Clear the Check Engine or Service Engine Soon indicator light. Read and clear stored Freeze Frame data. Supports thousands of vehicle trouble code definitions. Read the status of Continuously and Non-Continuously Monitored Tests. Full support for printing and print preview. 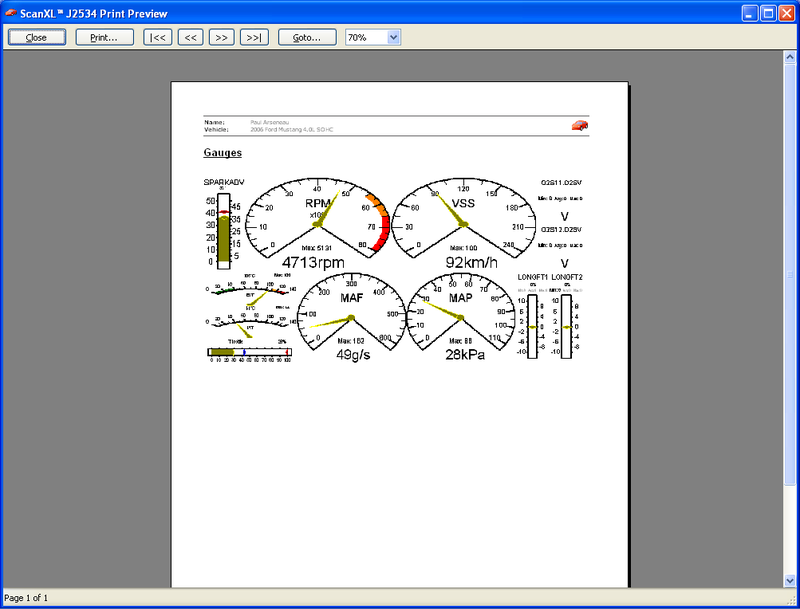 All of the different views, including the virtual dashboards, support printing/print preview. For those who possess a knowledge of the OBD-II protocol, ScanXL™ provides an OBD-II Terminal where you can send custom commands to the vehicle. Configurable alerts system - the alerts system allows you to configure the software to monitor any parameter(s) you like. 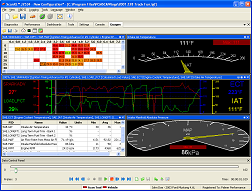 When the specified conditions are met, the software will automatically play a sound (to warn you if you are driving) or insert a bookmark for you into the logged data that is being recorded.